Submitted by lynn on Monday, June 12, 2017 - 12:48pm. With all the non-stop hustle and bustle of life, sometimes all you really crave is an evening out with the girls. My friend San Diego Food Girl kindly set up an intimate dinner in downtown San Diego at Whiskey Girl. 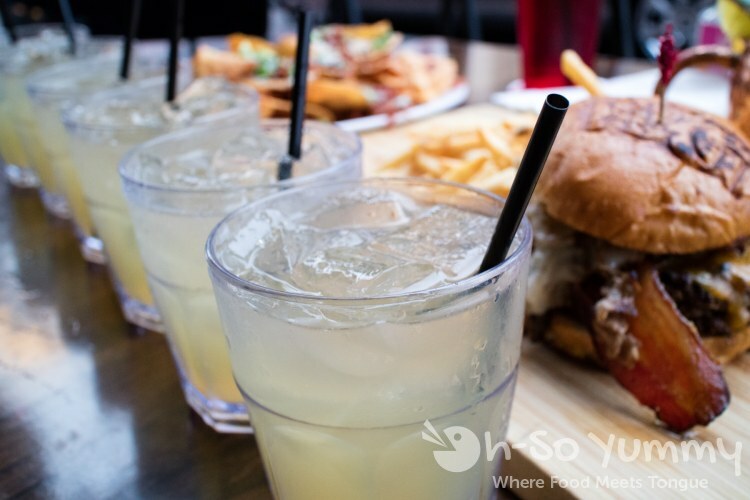 This longstanding entertainment establishment offers a impressive collection of 70+ whiskeys as well as cocktails, craft beers and most importantly tasty eats. Whiskey Burger with shot of Jack Daniels - Whiskey basted burger topped with cheddar cheese, applewood smoked bacon, Philly sirloin steak with sauteed onions and mozzarella cheese. One big perk of this group... we follow the all important food/drink protocol - the camera eats first! Plenty of appetizers were ordered for sharing but I captured my money shot with the main entree. Isn't it majestic? The initials W.G. were branded into the top of the fluffy yet hardy burger bun. Underneath, the generous sized juicy patty, oozy melted cheese and protruding thick cut bacon made for a satisfying bite. 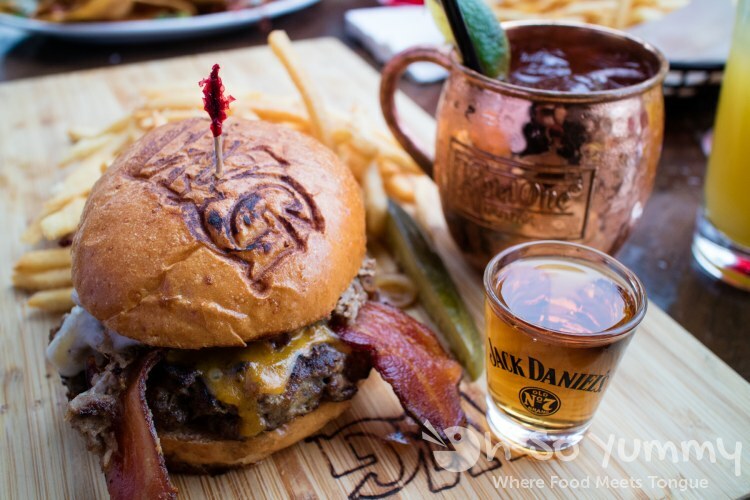 This burger comes WITH a shot of Jack Daniels, which dear Savvy Sweets took for the team! The copper mug mule in the background was one of the individual drinks ordered at our table. These drinks weren't all mine I promise! Every lady in our group had one glass, courtesy of the band The Heart who was playing later that night (more details later in post). My drink of choice was the Soco Storm cocktail which was exactly what I had in mind for a total girlie drink! After sampling these delicious wings at multiple Taste of Downtown events, I ordered these to share. The fried skin beneath the sauce retained some crispiness and the sweet and hint of spicy sauce left a deliciously sticky mess on lips and fingers. 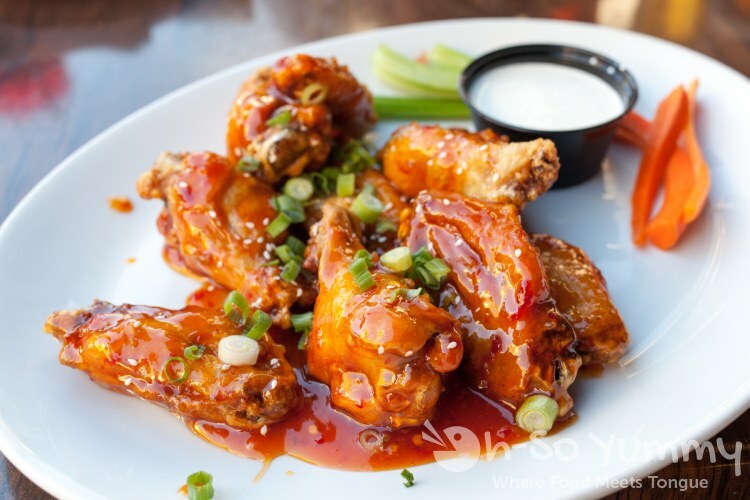 Luckily, with a bounty of food at our table, there was no need to fight over the last wing! The major carb fest began immediately once these two appetizers dropped onto our table. The nachos were relatively standard but I found pleasure in the homemade chips. 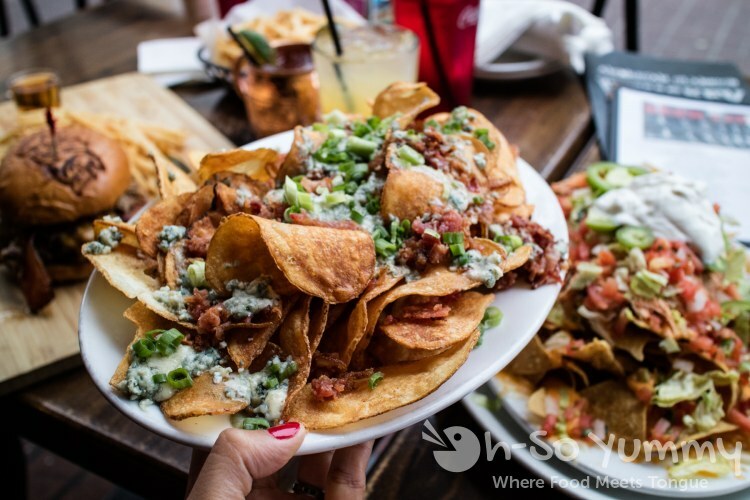 Well balanced with bits of bacon and mini globs of blue cheese, these crunchy potato chips just had more fried goodness than nacho chips. 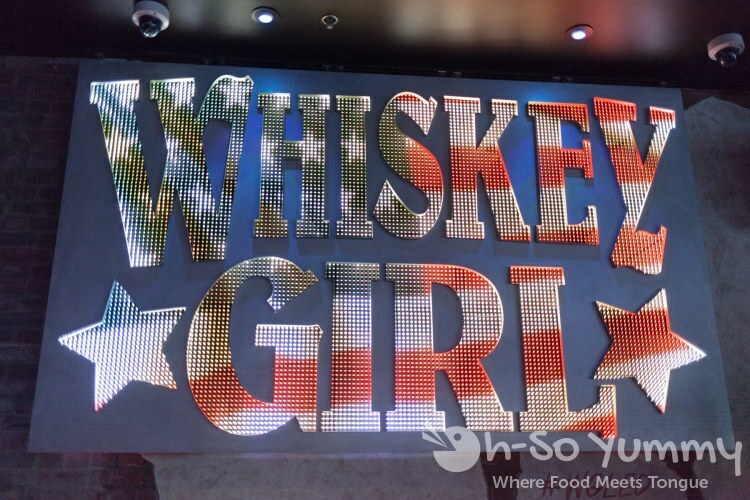 Whiskey Girl also has various seasonal or happy specials available. Last summer Dennis and I ordered the summer beer pairing menu which included three beer samples and three appetizer samples for only $12. 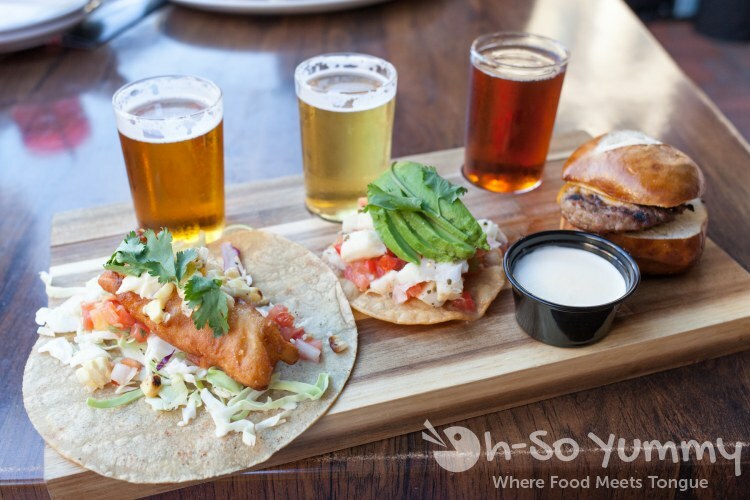 From left to right, the beers consisted of Sam Adams lager, Saint Archer blonde, and Karl Strauss red trolley while the food was a baja fish taco, ceviche tostada, and beef slider. The taco worked out to be the best appetizer of the three but I think girls night out had better food. 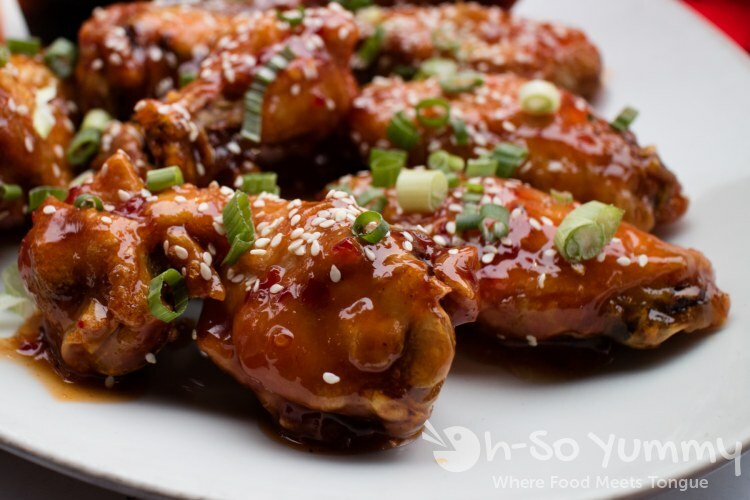 We also had the Thai Chili Wings back then, which were still phenomenal, staying beautifully crisp, even with sauce, downt to the last wing. They were $5 during happy hour! But enough of that, let's get back to girls night. After attempting to finish an abundance of food, we moved inside to obtain prime seating for live music. The Heart is a fantastic band consisting of Dale Peters and Cindy Helt. Their passion for music was evident as they beautifully belted out popular top 40 radio hits. The crowds swayed lazily, mesmorized by the beats. 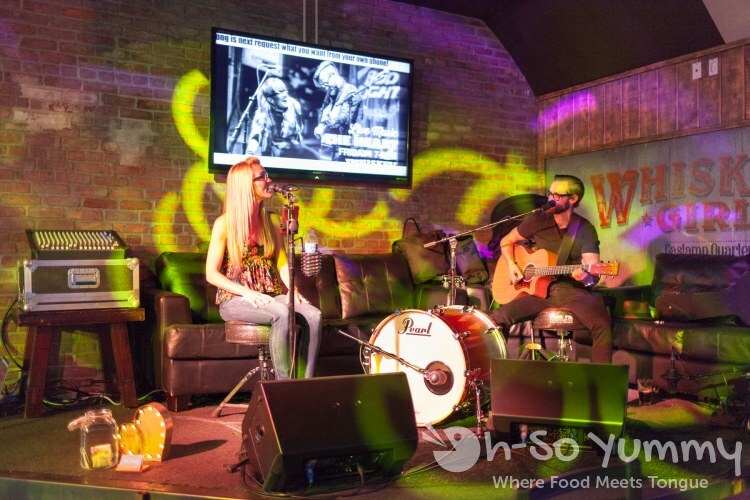 Lucky for you, they play quite often at this venue so check the Whiskey Girl event schedule for their next performance. 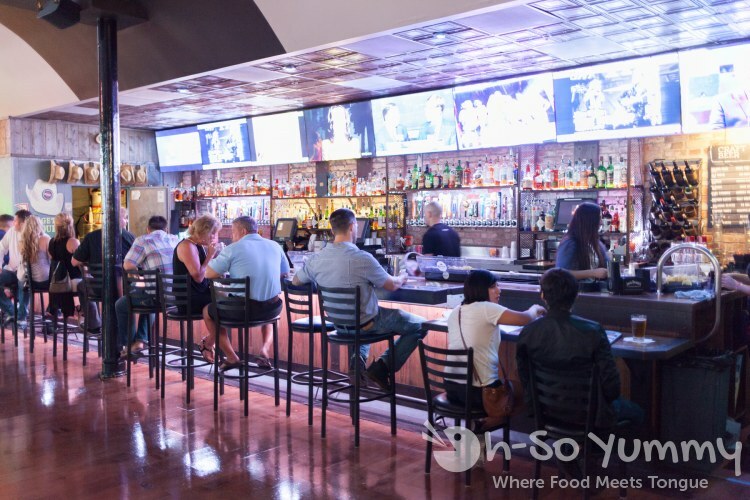 In case you need a little more liquid fun, there's a large bar in the back as well as a side room with its own bar. Multiple TV screens allow for sports watching. On the weekend there's more of a nightclub scene but casual hangouts such as this girls night would be more of my jam. I've been meaning to write this review since my initial visit with Dennis prior but this little get-together motivated me to finally get words to the screen! Here's some link love to the ladies who joined me that night: Ashley Sprankles, Autumn Aquarius Adventures, First Comes Latte, San Diego Food Girl and Savvy Sweets. Thanks to the manager Jake for hosting our entertaining night out and I can't wait to see everyone next time! Yum! 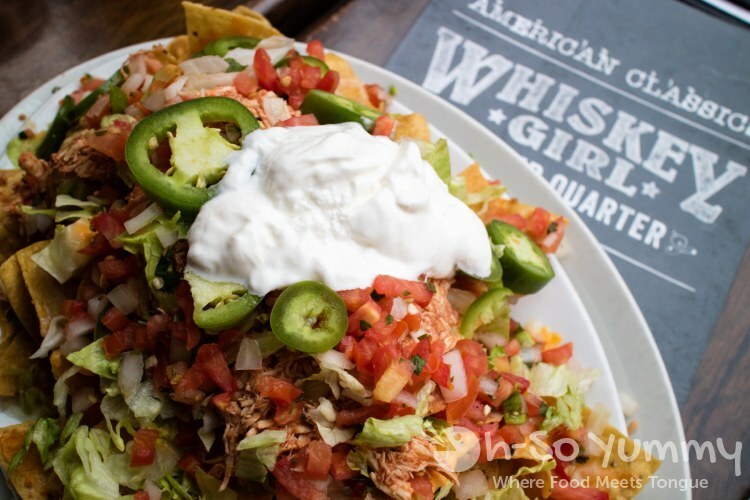 I've never been to Whiskey Girl so I'll def have to give it a try! I'd recommend either the wings or the burger and go on a quieter weeknight (unless you want the lively environment)! I've only been here for drinks, but I want to go back to get those homemade chips. And whiskey, obv. It's my drink of choice when I'm not drinking wine! That place looks awesome and the food oh so yummy! It sounds like a place I would love to go to with my fiance or friends. Thanks for sharing with me. it's a nice spot to spend with good company. i really dig the music nights. Great looking burger! I've been wanting to visit after I sampled their burger during Taste of the Gaslamp. yes, this burger tasted better than their version from burger week with the crispy onions... maybe it changes once in a while? Oh, that hamburger looks so good! That beer paring looks fun, too! What a feast! I've heard great things about this restaurant. The shot of JD with the burger is too fun. quite a feast! hope you get to check it out with a good friend!